fostering awareness of the Board's mandate, activities and achievements through communication, dissemination of information and public education. Faced with the ever increasing complexities of pharmaceuticals management in Canada, the PMPRB is called upon to be increasingly flexible and responsive to a dynamic environment. Our work in 2005 built on the solid foundation achieved in the past and through our continuing commitment to effectiveness and transparency. The initiatives we undertook in 2005 have set the course for our activities and our priorities for the next year. Through our Timelines project, we streamlined our regulatory activities and made the scientific review process more efficient and transparent. The PMPRB's regulatory activities increased in 2005. In addition to the ongoing review of the prices of new and existing patented drugs, Board Staff completed its work on nearly 80% of the investigations and 90% of the drug prices under review reported in the 2004 Annual Report. Furthermore, a total of eight Voluntary Compliance Undertakings and four Notices of Hearing were recommended to the Chairperson. In November 2005, the PMPRB received direction from the federal Minister of Health, on his behalf and that of his provincial and territorial colleagues, to monitor and report on nonpatented prescription drug prices. The first report will be published in June 2006, with reports on different themes to follow each quarter. In addition, two studies under the National Prescription Drug Utilization Information System were published in 2005. Again this year, we have enhanced the pharmaceutical trends section of the Annual Report, with new and more in-depth analysis of the key pharmaceutical indices to offer readers a better understanding of the current context. We initiated consultations on the review of the Patented Medicines Regulations, 1994, to streamline the price review process and increase its efficiency. Proposed amendments were published in Canada Gazette Part I for final stakeholder comment in December 2005. With the contribution of our stakeholders, we examined the issue of price increases for patented medicines. As a result, more pressing issues related to the review of introductory patented drug prices were identified and will be the subject of consultations in 2006. 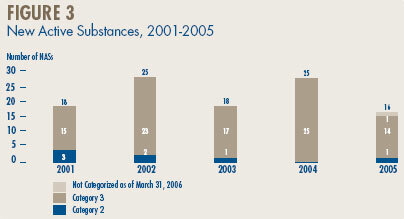 Sixty-six new patented drug products were reported to the PMPRB in 2005, of which 16 were new active substances. As of March 31, 2006, 64 new patented drug products had been reviewed. Of those, 49 were considered to be within the Guidelines, while 15 are subject to ongoing investigations. The Board approved eight Voluntary Compliance Undertakings and completed its hearing in the matter of LEO Pharma Inc. and the price of the psoriasis medicine “Dovobet”. Total sales of all drugs for human use by manufacturers in Canada rose to $16.1 billion representing a slight 1.3% increase over 2004. This is the lowest rate of growth in the last fifteen years. 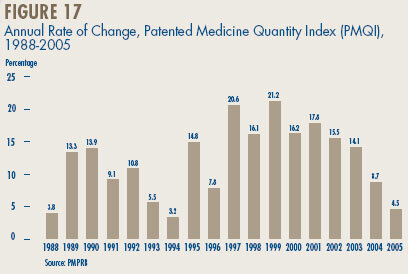 Sales of patented drugs increased by 5.5% to $11.5 billion in 2005, the lowest rate of increase since 1994. The share of total sales accounted for by patented drugs rose to 71.4%, continuing the upward trend that began in 1994 when patented drugs accounted for 40.7% of total sales. 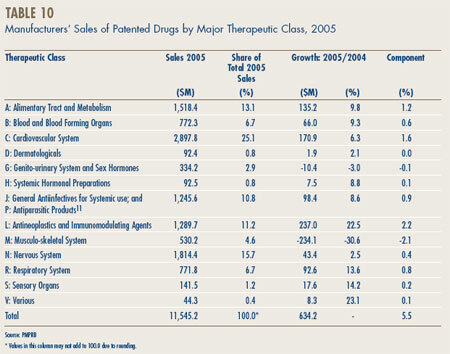 In 2005, the antineoplatics and immunomodulating agents (such as drugs used in chemotherapy) were the leading contributing drug class to sales growth. 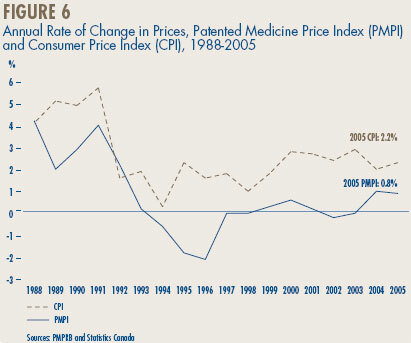 Prices in Canada – the manufacturers' prices of patented drugs, as measured by the Patented Medicine Price Index (PMPI), increased on average by 0.8% in 2005. The Consumer Price Index (CPI) was at 2.2% over the same period. Again this year, analysis of prices by therapeutic class demonstrates considerable variability in price changes. New information in this year's report also shows that, in the last three years, the PMPI varied considerably by class of customer (hospital, pharmacy, wholesaler) and across the provinces and territories. 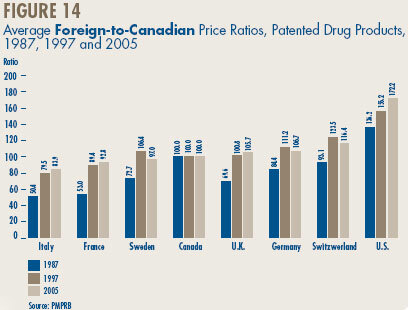 Canadian-to-foreign prices – the ratio of Canadian prices to the international median for comparator countries was again below parity, with Canadian patented drug prices being on average about 92% of the corresponding median international price. 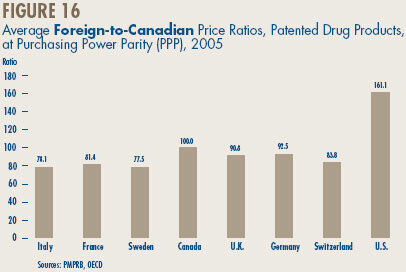 Prices of patented drugs in Canada were on average somewhat less than prices in the U.K., Germany and Switzerland, but greater than prices in Italy, France and Sweden. As in previous years, U.S. prices were substantially higher than prices in Canada. Patentees reported total R&D expenditures of $1.2 billion in 2005, an increase of 5.5% over the previous year. Rx&D members reported R&D expenditures of $1.0 billion, an increase of 2.9% over last. The R&D-to-sales ratio for all patentees increased slightly to 8.7% from 8.3% in 2004, as did the R&D-to-sales ratio for members of Rx&D – 8.8% compared to 8.5% in the previous year. This is the third consecutive year that the ratio is below 10%. Patentees reported spending $215.1 million on basic research. 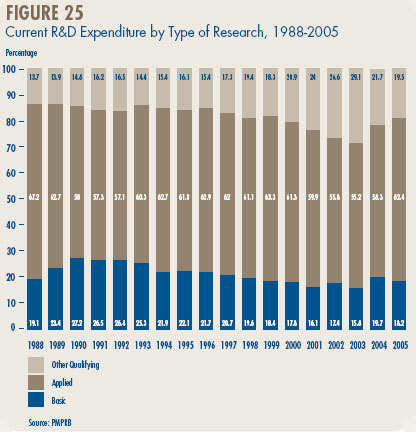 While it represents 18.2% of current R&D expenditures, the proportion of spending aimed at basic research decreased by 3% in 2005 relative to the previous year. There is little dispute that the pharmaceutical industry in Canada is a dynamic and evolving sector of the economy. This fact is reflected in the nature and volume of the daily activities, which shape the mandate of the Patented Medicine Prices Review Board. After a year at the PMPRB, I have gained a clear understanding of the pharmaceutical environment, and have come to appreciate the key role played by this organization in not only regulating patented medicine prices, but also in providing crucial information to healthcare decision makers, which assists them in managing their many challenges. The events of 2005 have had a tremendous impact upon our operations in areas such as: mandate evolution; compliance; policy development; reporting; and finally, our ongoing consultative process. A brief analysis of these areas will serve to demonstrate the many moving forces and challenges facing the pharmaceutical industry. Compliance activities have become more efficient, through the streamlining of our scientific and price review processes. With our Timelines Initiative, we have established new and more exact reporting deadlines, that have resulted in proposed amendments to the Patented Medicines Regulations, 1994. These changes will bring about a more effective price review process, which will benefit both consumer and patentee. During 2005, consultations were held regarding the price increases for patented medicines. These consultations raised the issue of the appropriateness of the Board's current Excessive Price Guidelines. As a result, we have launched a new consultation process which will include a Discussion Guide, written submissions, and face-to-face meetings with invited stakeholders, scheduled for November 2006. Based on the input from submissions on the Discussion Guide and these meetings, we will be developing a series of options, which may result in the revision of certain elements of the Guidelines. The scope and complexity of the pharmaceutical sector, requires an in-depth understanding of market forces, and their impact on the everyday lives of Canadians, as well as on public and private drug plans. An overview of the "big picture" is critical to the appreciation of this complexity. It is generally recognized that the expertise of the PMPRB makes it uniquely positioned to provide in-depth analyses and interpretations of drug price trends, and the factors that influence them. In the context of the National Pharmaceuticals Strategy, initiated by the First Ministers in 2004, the federal/provincial/territorial Ministers of Health, have been working to address the steady increase of drug costs in Canada. As part of this effort, they recently called upon the PMPRB to monitor and report on non-patented prescription drug prices. The PMPRB will publish quarterly reports according to the Terms of Reference agreed upon by the federal/provincial/territorial governments. These reports should provide comprehensive and accurate information on non-patented prescription drug prices, and on the cost drivers. Despite the many new challenges and emerging issues in our sector, we continue to meet the growing demands upon our resources, and to fulfill our operational responsibilities. Over the past year, the Board has approved eight Voluntary Compliance Undertakings, issued four Notices of Hearing into the prices of patented medicines, an unprecedented number in a short period of time, and released a number of studies under the National Prescription Drug Utilization Information System, in addition to our usual activity. The professionalism and dedication of the Board Members and the Board Staff remain invaluable resources in ensuring the effectiveness of the PMPRB in carrying out its mandate to support the goal of improved health care for all Canadians. 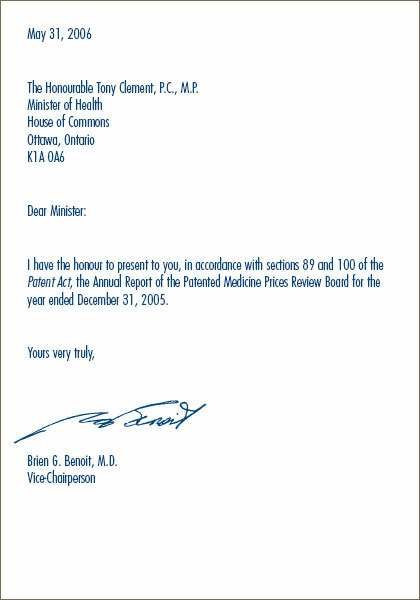 Although the PMPRB is part of the Health Portfolio, it carries out its mandate at arms-length from the Minister of Health.1 It also operates independently of other bodies such as Health Canada, which approves drugs for safety and efficacy, and public drug plans, which approve the listing of drugs on their respective formularies for reimbursement purposes. Reporting – To contribute to informed decisions and policymaking, by reporting on pharmaceutical trends of all medicines, and on R&D spending by pharmaceutical patentees. As part of the September 2004 "10-year Plan to Strengthen Health Care" a Memorandum of Understanding (MOU) between Health Canada and the PMPRB set out to expand its analytical and reporting functions with a focus on nonpatented prescription medicines. This added initiative represents enhancement of the statutory Reporting mandate of the PMPRB. Regulating – The PMPRB is responsible for regulating the prices that patentees charge, the factory-gate price, for prescription and nonprescription patented drugs sold in Canada to wholesalers, hospitals, pharmacies or others, for human and veterinary use, to ensure that they are not excessive. The PMPRB regulates the price of each patented drug product, including each strength of each dosage form of each patented medicine sold in Canada. This is normally the level at which Health Canada assigns a Drug Identification Number (DIN). In Canada, Health Canada assesses new medicines to ensure that they conform to the Food and Drugs Act and the Food and Drug Regulations. Formal authorization to market or distribute a medicine is granted through a Notice of Compliance (NOC). A medicine may be temporarily distributed with specified restrictions before receiving a NOC, as an Investigational New Drug or under the Special Access Program. The PMPRB has no authority to regulate the prices of non-patented drugs, and does not have jurisdiction over prices charged by wholesalers or retailers, or over pharmacists' professional fees. Also, matters such as distribution and prescribing are outside the purview of the PMPRB. Under the Patented Medicines Regulations,1994, patentees are required to file price and sales information twice a year for each strength of each dosage form of each patented medicine sold in Canada for price regulation purposes. Patentees are also required to file R&D expenditures once a year for reporting purposes. Manufacturers are also required to inform the PMPRB of their intention to sell a new patented medicine but are not required to obtain approval of the price before they do so. Patentees are required to comply with the Act to ensure that prices of patented medicines sold in Canada are not excessive. In the event that the Board finds, after a public hearing, that a price is excessive in any market it may order the patentee to reduce the price and take measures to offset any excess revenues it may have received. Reporting – The PMPRB reports annually to Parliament through the Minister of Health. The Annual Report, which covers the calendar year, includes a review of the PMPRB's major activities, analyses of the prices of patented medicines and of the price trends of all drugs, and reports on the R&D expenditures as reported by patent-holding drug manufacturers. In addition, the PMPRB communicates with stakeholders through its quarterly NEWSletter and various studies. Pursuant to an agreement by the federal/provincial/territorial Ministers of Health and at the request of the federal Minister of Health, the PMPRB conducts research under the National Prescription Drug Utilization Information System (NPDUIS). The purpose of the NPDUIS is to provide critical analyses of price, utilization and cost trends so that Canada's health system has more comprehensive and accurate information on how prescription drugs are being used and on sources of cost increases. In 2005, the Minister of Health, on behalf of himself and his provincial and territorial colleagues, directed the PMPRB to monitor and report on the prices of non-patented prescription drugs. This function is aimed at providing a centralized credible source of information on non-patented drug prices. 1 The Health Portfolio contributes to specific dimensions of improving the health of Canadians. It comprises Health Canada and five agencies, the Public Health Agency of Canada, the Canadian Institutes of Health Research, the Hazardous Materials Information Review Commission, the Patented Medicine Prices Review Board, and the newly established Assisted Human Reproduction Agency of Canada. The Board consists of not more than five members who serve on a part-time basis, appointed by the Governor-in-Council, including a Chairperson and Vice-Chairperson. The Chairperson is designated under the Patent Act as the Chief Executive Officer of the PMPRB with the authority and responsibility to supervise and direct its work. The Executive Director manages the work of the Staff. In addition to the Executive Director, Senior Staff consists of the Director of Compliance and Enforcement, the Director of Policy and Economic Analysis, the Director of Corporate Services, the Secretary of the Board and Senior Counsel. 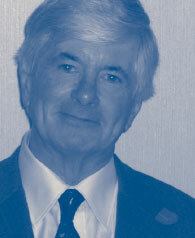 Dr. Robert G. Elgie completed two five-year terms as Chairperson of the Board in March 2005. Réal Sureau, Vice-Chairperson, took over the responsibilities of Chairperson of the PMPRB and ensured continuity until the end of October 2005 when his ten-year term of office at the PMPRB expired. Until a permanent Chairperson is appointed, Dr. Brien G. Benoit assumes the powers and functions of the Chairperson. Dr. Benoit was appointed Member of the Board in May 2005 and Vice-Chairperson as of October 2005. Vice-Chairperson: Brien G. Benoit, B.A., M.D., M.Sc., F.R.C.S.C., F.A.C.S. Brien G. Benoit was appointed Member of the PMPRB in May 2005 through May 2010. In October 2005, he became Vice-Chairperson and has been assuming the duties and powers of the Chairperson until a permanent Chairperson is appointed. A neurosurgeon, Dr. Benoit is on the Active Attending Staff of The Ottawa Hospital. Dr. Benoit is also a Professor of Neurosurgery at the University of Ottawa. Throughout his career, Dr. Benoit has held several administrative positions including Chief of Staff of the Ottawa Civic Hospital, from 1996 to 1998; Program Director, Neurosurgery, at the University of Ottawa, from 1995 to 2003; Chair of Neurosurgery at the University of Ottawa, from 1997 to 2003; and Deputy Surgeon-in-Chief at the Ottawa Hospital (Civic Campus) from 2002 to 2004. Dr. Benoit was also Chair of the Operating Room Committee at the Ottawa Hospital (Civic Campus), from 1993 to 2004. Thomas (Tim) Armstrong, Q.C., O. Ont. Tim Armstrong was appointed Member of the Board on October 3, 2002 to October 2007. Anthony Boardman was appointed Member of the Board in January 1999 to January 2004. He was re-appointed in March 2005 for a five-year term. Dr. Boardman is the Van Dusen Professor of Business Administration at the University of British Columbia (UBC). He graduated from the University of Kent at Canterbury, England, (B.A.) and Carnegie-Mellon University (Ph.D.). Prior to taking up his position at UBC, he was a professor at the Wharton School, University of Pennsylvania. Between 1995 and 2001, he was a member of the Pharmaceoeconomic Initiative Scientific Committee in British Columbia. 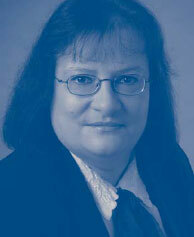 Dr. Boardman's research interests include publicprivate partnerships, cost-benefit analysis and strategic management. During his career, he has published many articles in leading academic journals. Recently, he and his co-authors completed the third edition of Cost-Benefit Analysis: Concepts and Practice. He is an Associate Editor of the Journal of Comparative Policy Analysis and Research. Dr. Boardman has taught executive programs throughout the world. He has won many teaching awards, including the Alan Blizzard award and the CGA Graduate Teacher Award. He has been a consultant to many private and public organizations, and is President of Norfolk Consulting Group. 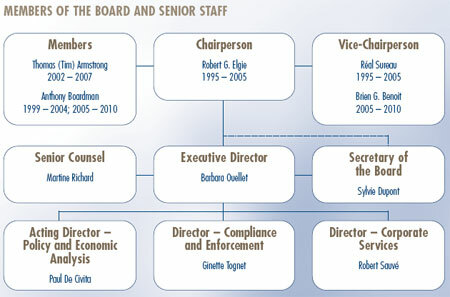 Robert G. Elgie was appointed Chairperson of the PMPRB in March 1995 and re-appointed in March 2000. He completed his second and last term as Board Member and Chairperson in March 2005. Dr. Elgie, a lawyer and neurosurgeon, Fellow of the Royal College of Surgeons (Neurosurgery), was the founder and first Director of Dalhousie University's Health Law Institute from 1991 to 1996. He was also the part-time Chair of the Workers' Compensation Board of Nova Scotia from 1992 to 1996. Dr. Elgie has taught at the Medical Schools of Queen's University and the University of Toronto, and held several positions with the Scarborough General Hospital including Chief of Medical Staff. In 1977, he was elected to the Ontario Legislative Assembly and subsequently served in several Cabinet positions. He resigned from the Ontario Legislature in September 1985 to become Chair of the Workers' Compensation Board of Ontario where he served until 1991. In October 2000, Dr. Elgie was appointed to the Ontario Press Council. In June 2005, Dr. Elgie was appointed Chair of the Ontario Greenbelt Council. Réal Sureau was appointed Member and Vice-Chairperson of the Board in October 1995 and re-appointed in October 2000 to October 2005. Mr. Sureau assumed the functions of Chairperson of the PMPRB on March 8, 2005, until the end of his term in October. He is a graduate of accountancy courses at Queen's University and McGill University and became a chartered accountant in 1963. From 1957 until 1973, Mr. Sureau practiced public accounting and auditing in a regional firm. He then became Vice-President, Finance, of Forex Inc. engaged in sawmill activities, from 1973 to 1982. He subsequently became the chief financial officer of the Canam Manac Group Inc., a North American leader in the manufacturing of steel trusses and semi-trailers until 1992. He then pursued his career as a business consultant and a corporate director. Mr. Sureau was a director and member of several committees of the Québec Order of Chartered Accountants which he served as Chairperson in 1995-1996. He was granted an honorary Fellowship in 1986. Mr. Sureau is President of Sureau Management Limited. Since 1982, he has served on several boards of directors of reporting issuers and other private organizations, including Gaz Métro Inc. where he sits as a director and member of the committee on pension funds, and has been chairing its audit committee since 1995. Mr. Sureau has also been serving as a member of the Pension Fund Committee of the Canadian Red Cross since 2005. 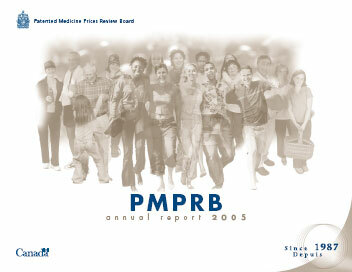 The PMPRB operated with a budget of $5,606,000 in 2005-2006 and an approved staff level of 45 employees. The budget included resources for monitoring and reporting on the non-patented prescription drug prices in Canada under the National Pharmaceuticals Strategy (NPS), and for the National Prescription Drug Utilization Information System (NPDUIS). The PMPRB estimates total manufacturers'sales by summing sales of patented, nonpatented brand name, and generic drugs. For this purpose, a “patented drug” is any product currently subject to the PMPRB price review. A “non-patented brand name drug” is a product sold by a current patentee (that is, a manufacturer currently selling one or more products subject to the PMPRB price review) that is not itself currently patented (either because a patent is pending, all patents applicable to the product have expired, or because the product was never patented). 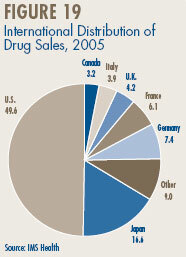 Sales of all drugs rose to $16.1 billion in 2005, an increase of 1.3 % over 2004 sales. This rate is markedly less than the rate of 5.3% recorded in the previous year and the rate of 15.2% recorded in 2003. It is the lowest rate of the last fifteen years. More detailed information on sales of drugs in Canada is available in the REPORTING INFORMATION ON KEY PHARMACEUTICAL TRENDS section on page 19.
continue to file detailed information on prices and sales of each patented drug for the first and last six-month period of each year (Form 2), i.e., July 30 and January 30 respectively, for as long as the drug remains patented. The PMPRB reviews the pricing information for all patented medicines sold in Canada on an ongoing basis to ensure that the prices charged by patentees comply with the Excessive Price Guidelines (Guidelines) established by the Board. The Guidelines are published in the PMPRB's Compendium of Guidelines, Policies and Procedures (Compendium) and are available on the Web site under Legislation, Regulations and Guidelines, or by calling our toll-free number: 1 877 861-2350. As part of the PMPRB's transparency initiative, beginning in 2001, the list of New Patented Medicines Reported to the PMPRB is posted on our Web site every month. This list includes information on the status of the review (i.e., under review, within Guidelines, VCU, Notice of Hearing). Drug products “under review” also include drugs which are subject to an investigation. As reported in the April 2005 NEWSletter, beginning in 2005, drugs that are the subject of an investigation are no longer reported as “under review”. When the price appears to exceed the Guidelines and where the criteria for commencing an investigation have been triggered, these drug products are identified as “under investigation”. In order to fulfill its mandate, the PMPRB relies upon the patentees' full and timely disclosure, as described on page 7, of any and all medicines being sold in Canada to which a patent pertains. Late filing by patentees is an important issue because it may delay the price review and although, ordinarily, most patentees ultimately comply with the filing requirements, there is an issue regarding a number of patentees' failure to file (FTF) complete information within the time frames specified in the Regulations. 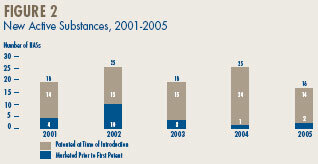 In 2005, 3 new drug products (7 DINs) were first reported to the PMPRB although they were patented and sold prior to 2005. Dicletin and Neurontin were sold in Canada prior to coming under the PMPRB's jurisdiction in 2000 and 2001, respectively. The Board issued two Orders to patentees who failed to file pricing and sales information for the July to December 2005 period. Novartis Consumer Health Canada Inc. and Gilead Sciences Inc. had failed to provide information as required pursuant to subsection 80(1) of the Act, and subsections 4(1), (2) and (3) of the Regulations. The Board is pleased to report that they ultimately met their obligations and filed their regulatory data. Information on the statutory reporting requirements is available in the Act, the Regulations, the Compliance and Enforcement Policy of the Guidelines, and the Patentees' Guide to Reporting which can be found on our Web site under Legislation, Regulations and Guidelines. 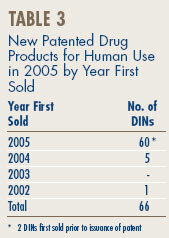 There were 66 new patented drug products, or DINs, for human use introduced in 2005. Some are one or more strengths of a new active substance (NAS) and others are new presentations of existing medicines. 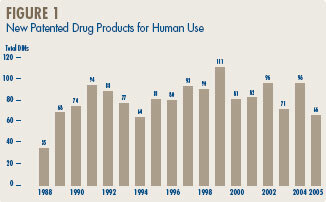 Figure 1 below provides information on new patented drug products for human use from 1988 to 2005. Eight (12.1%) of the 66 new patented DINs were being sold in Canada prior to the issuance of a Canadian patent which brought them under the PMPRB's jurisdiction. These DINs are denoted by a “FPG” (first patent granted) in Annex 2 on page 51. Table 3 identifies the number of patented drug products by the year in which they were first sold. The time delay between date of first sale and date of patent grant for these products ranged from several months to three years. A list of the 66 new patented drug products and their price review status at the time of this report, appears in Annex 2 on page 51. Of the 66 new patented DINs, the prices of 64 had been reviewed. Fifteen were priced at levels which appeared to be outside the Guidelines and investigations were commenced. For a more detailed explanation of the criteria for commencing an investigation, please refer to Annex 1 on page 50. A total of 49 new patented DINs introduced in 2005 were found to be within the Guidelines. For the purpose of this report, existing medicines include all patented drug products that were introduced prior to December 1, 2004. The PMPRB's Guidelines limit the price changes for existing patented drugs to changes in the Consumer Price Index (CPI). In addition, the price of a patented drug cannot exceed the highest price of the same drug product in the countries listed in the Regulations (France, Germany, Italy, Sweden, Switzerland, the United Kingdom, and the United States). 22 DINs were still under review. A summary of the review, compliance and investigation status of the new and existing patented drug products for human use in 2005 is provided in Table 5. The Common Drug Review (CDR) is a single process for reviewing new drugs and providing formulary listing recommendations to participating publicly-funded federal, provincial and territorial drug benefit plans in Canada. All jurisdictions are participating except Quebec. The CDR reviews new drugs and provides an evidence-based formulary listing recommendation, made by the Canadian Expert Drug Advisory Committee (CEDAC). The drug plans consider the CEDAC recommendation and also their individual plan mandates, priorities and resources when making formulary listing and coverage decisions. More information on CDR and CEDAC is available from the Canadian Agency for Drugs and Technologies in Health (CADTH) Web site (http://www.cadth.ca). 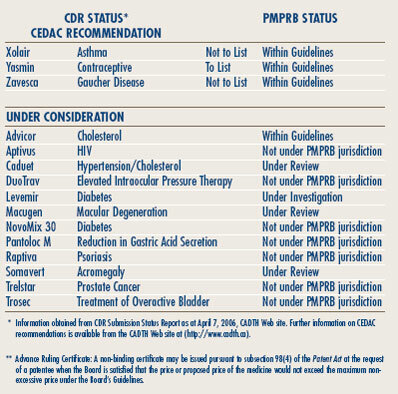 Table 6, on page 12 provides information on CDR reviews and on the PMPRB price reviews. 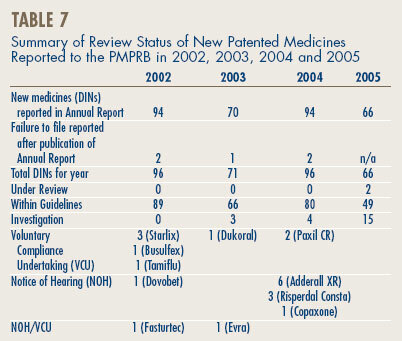 Table 7 provides an update of the new patented medicines, at the DIN level, reported in previous years' Annual Reports. In last year's Annual Report, it was reported that of the 993 existing patented drug products for human use sold in 2004, the prices of 55 were still under review. The results of those reviews concluded that 26 had been within the Guidelines; seven resulted in a VCU; 15 DINs were priced at levels that appeared to exceed the Guidelines and therefore investigations were initiated and one Notice of Hearing was issued. Six are still under review and included in the total figure of existing drugs under review reported in Table 5, on page 11. In its 2004 Report, the PMPRB had also reported that 21 DINs were under investigation. Of those, 15 investigations have been concluded: in ten cases the prices were ultimately found to be within the Guidelines; and for five cases, Voluntary Compliance Undertakings were approved – Dukoral, Starlix (3), and Ceretec. (See Voluntary Compliance Undertakings on page 14.) Six are still under investigation and included in the total figure of existing drugs under investigation reported in Table 5, on page 11. Proposed amendments to the Regulations for consultation with stakeholders were published in the January 2005 NEWSletter. The deadline for stakeholders' submissions on these proposed amendments was April 15, 2005. Following the initial consultation, no changes were suggested for revisions to the proposal to regulate veterinary drugs on a complaints-based approach. The collection of all proposed amendments to the Regulations were pre-published in Canada Gazette, Part I, on December 31, 2005, with a subsequent formal 30-day comment period. Several submissions were received from interested stakeholders, and the comments received have been considered and incorporated into the Canada Gazette, Part II submission, currently under preparation. We expect the Canada Gazette Part II publication to take place by early summer 2006. For the time being, the complaints-driven approach for regulating the prices of patented veterinary drugs remains in place. Board Staff only reviews the introductory prices of new patented veterinary medicines. Existing medicines are subject to review only when a substantiated complaint has been received. No complaints were received in 2005. In last year's Annual Report it was reported that 3 DINs were under review. The 3 DINs along with the 4 DINs introduced in 2005 have been found to be within the Guidelines. The summary reports of the price reviews of veterinary drug products are made available on the PMPRB's Web site under Regulatory; Patented Medicines; Reports on New Patented Drugs for Veterinary Use. 2 Because of the timing of the filing requirements under the Patented Medicines Regulations,1994 and the manner of calculating benchmark prices, drug products introduced or patented in December are considered to be new patented products in the following year. 3 Annual Drug Submission Performance Report, Section 4, January-December 2005, Therapeutic Products Directorate, Health Canada. • Category 1 - a new DIN of an existing or comparable dosage form of an existing medicine, usually a new strength of an existing drug (line extension). • Category 2 - the first drug to treat effectively a particular illness or which provides a substantial improvement over existing drug products, often referred to as “breakthrough” or “substantial improvement”. • Category 3 - a new drug or new dosage form of an existing medicine that provides moderate, little or no improvement over existing medicines. A Voluntary Compliance Undertaking (VCU) is a written undertaking by a patentee to adjust its price to conform with the PMPRB's Excessive Price Guidelines. Detailed information and definitions are available in the Glossary Section of this Report. Under the Compliance and Enforcement Policy, patentees are given an opportunity to submit a VCU when Board Staff concludes, following an investigation, that the price set forth by the patentee appears to have exceeded the Board's Excessive Price Guidelines (Guidelines). It has been the practice of the Board to publish VCUs upon their approval by the Chairperson or the Board. Once a patentee has been informed that the terms of a VCU have been approved, the document becomes public. In the context of the PMPRB's policy on compliance and enforcement, VCUs are posted on our Web site, reported in our NEWSletter, and, of course, in the Annual Report. Approval of a VCU by the Chairperson is an alternative to the commencement of formal proceedings through the issuance of a Notice of Hearing. Under the PMPRB's Compliance and Enforcement Policy, a VCU can also be submitted following the issuance of a Notice of Hearing. A VCU submitted at this point must be approved by the Board. Starlix, Novartis Pharmaceuticals Canada Inc.
Evra is a contraceptive transdermal system. On February 21, 2005, the Board concluded proceedings commenced on December 23, 2004, in regard to the patented medicine Evra by accepting a VCU by Janssen-Ortho Inc. (Janssen-Ortho) Under the terms of the VCU, Janssen-Ortho lowered the price of Evra by approximately 45% to $4.47 per patch. To offset excess revenues from past sales of Evra accrued from the date of first sale to June 30, 2004, Janssen-Ortho made an initial payment to the Government of Canada in the amount of $1,359,263.67. The balance of excess revenues remaining, totalling $1,496,019.02, for the period July 1, 2004 to December 31, 2004, was offset through a combination of reducing the price of one of Janssen-Ortho's patented medicines, Levaquin 5mg/mL and 25mg/mL as of March 1, 2005, and payments were made to the Government of Canada in the amount of $683,272. Paxil CR provides a controlledrelease to the alternative range of presentations of Paxil, an anti-depressant. GlaxoSmithKline (GSK) undertook to reduce the average transaction prices of Paxil CR by the end of the January to June 2005 regulatory filing period such that the average transaction prices for 2005 did not exceed the 2005 maximum non-excessive (MNE) prices of $1.5861 for Paxil CR 12.5 mg and $1.7019 for Paxil CR 25 mg.
To offset excess revenues GSK made a payment to the Government of Canada in the amount of $310,403.64. Hoffmann-La Roche Limited (Roche) agreed that the MNE price of Tamiflu 75 mg capsule is $3.7695 for the period January 2003 to December 2003; $3.8383 for the period January to December 2004; and $3.8917 for the period January to December 2005. Roche undertook to ensure that the average transaction price (ATP) of Tamiflu 75 mg capsule did not exceed the MNE price of $3.8917 per capsule for 2005. To offset excess revenues received for the reporting periods January 2003 to December 2004, Roche made a payment to the Government of Canada in the amount of $442,973.47. Ceretec is a radiopharmaceutical agent used for the diagnosis of brain diseases and tumors. Amersham Health Inc. (Amersham) agreed that the MNE price of Ceretec for 2004 is $173.1935, and for 2005 is $177.7475. It also ensured that the average transaction price (ATP) price of Ceretec did not exceed the MNE price of $177.7475 for 2005. Amersham also agreed to offset excess revenues of $278,112.65 it received from January 1, 2002 to December 31, 2004 by maintaining the price of Ceretec below the 2005 MNE price of $177.7475 until the end of December 31, 2005. In accordance with the terms of the VCU, as not all excess revenues were offset in this manner, Amersham made payments to its customers, in the amount of $12,326.31 to offset remaining excess revenues for the period of January 1, 2002, to December 31, 2004. The price of Ceretec remained under the PMPRB's jurisdiction until the expiry of the patent in April 2006. Starlix is indicated as monotherapy in addition to diet and exercise to lower the blood sugar in patients with type 2 diabetes mellitus who are not controlled satisfactorily by diet and exercise alone. Novartis Pharmaceuticals Canada Inc. (Novartis) undertook to reduce the price of Starlix 60 mg and 120 mg tablets so that the ATP in 2005 did not exceed the 2005 MNE price of $0.5044. Novartis made a payment of $174,306.29 to the government of Canada for the excess revenues that accrued during the period March 2002 through June 2005. Novartis will ensure that while patented, the ATPs of Starlix in Canada in future years do not exceed the MNE prices calculated in accordance with the Guidelines. The price of Starlix will remain under the PMPRB's jurisdiction until the expiry of the patent in February 2014. Ortho 7/7/7 is an oral contraceptive. On September 9, 2005, the Vice-Chairperson of the Board accepted a second VCU for Ortho 7/7/7. The first VCU had been accepted in November 1994. For the periods from January 1, 2001 through September 1, 2004, the prices of Ortho 7/7/7 16.485 mg/21 tablets and 16.485 mg/28 tablets, exceeded the CPI-adjusted MNE prices with resulting excess revenues of $99,892.72. In order to comply with the Guidelines, Janssen-Ortho agreed that the 2004 MNE prices of both products of Ortho 7/7/7, 21 tablets and 28 tablets were respectively, $11.4301 and $11.0616. To offset excess revenues, Janseen-Ortho made a payment to the Government of Canada for the excess revenues. The patent on Ortho 7/7/7 expired in September 2004 and the drug product is no longer under the PMPRB's jurisdiction. Dukoral™ is indicated for the protection against travellers' diarrhea and/or cholera in adults, and in children 2 years of age and older, who will be visiting areas where there is a risk of contracting travellers' diarrhea caused by enterotoxigenic E. coli or cholera caused by V. cholerea. The terms of the VCU required that Sanofi Pasteur Limited (sanofi pasteur) agree that the MNE price of DukoralT™ was $25.1842 in 2004, $25.9901 in 2005, and, based on the CPI methodology, $26.6449 in 2006; and reduce the ATP of Dukoral™ by the end of the January 1 to June 30, 2006 regulatory filing period to the lower of the 2006 MNE price of $26.6449 or the highest international price. To offset excess revenues received during the period of April 23, 2003 to June 30, 2005, sanofi pasteur made a payment in the amount of $481,198.49 to the Government of Canada. A further payment in the amount of $74,073.32 was made for the period of July 1 to December 31, 2005. Finally, sanofi pasteur will ensure that the price remains within the Guidelines while Dukoral™ is under the PMPRB's jurisdiction until the expiry of its patent in June 2016 or such time as Dukoral™ is no longer sold by sanofi pasteur in Canada. Risperdal is an anti-psychotic drug indicated for the management of schizophrenia and related psychotic disorders. Under the terms of the VCU, Janssen-Ortho agreed that the 2004 MNE prices of Risperdal 1 mg, 2 mg, 3 mg, 4 mg, 0.25 mg, and 0.5 mg tablets were respectively, $1.0223, $2.0410, $3.0507, $4.0643, $0.4426, and $0.7410. Janssen-Ortho also undertook to ensure that the ATPs of Risperdal did not exceed their respective 2005 MNE prices of $1.0421, $2.0806, $3.1144, $4.1481, $0.4527, and $0.7568 based on forecast CPI for 2005. To offset excess revenues of $669,426.81, Janssen-Ortho undertook to further reduce the ATPs of Risperdal tablets such that all excess revenues were offset no later than December 31, 2005. All excess revenues were offset by that date. Finally, the patentee will ensure that the prices of Risperdal 1 mg, 2 mg, 3 mg, 4 mg, 0.25 mg, and 0.5 mg tablets remain within the Guidelines until the patent expires in July 2006. Board Staff reviews the prices of all patented medicines sold in Canada to ensure that they are not excessive. Where prices are outside the Guidelines, Board Staff will initiate an investigation, which may result in a recommendation to the Chairperson to issue a Notice of Hearing. On April 20, 1999, the Chairperson of the Board issued a Notice of Hearing to consider whether, under sections 83 and 85 of the Patent Act, Nicoderm is being, or has been, sold by Hoechst Marion Roussel Canada Inc. (HMRC) in Canada at a price that, in the opinion of the Board, is excessive and if so, what order, if any, should be made. The matter was reported on in previous Annual Reports and selected issues of the NEWSletter. The PMPRB cannot assert jurisdiction on the basis of Canadian Patent Applications. On the issues dealing with the structure and manner of proceeding of the PMPRB, the Federal Court found that the PMPRB, as an administrative tribunal with economic regulatory functions, must be accorded a degree of flexibility and as such may perform multiple overlapping functions without creating a reasonable apprehension of bias. Furthermore, the Federal Court was of the view that the Board ought to be granted “a considerable degree of flexibility” in respect of its procedural requirements and as such found that natural justice and procedural fairness had been respected. With respect to the issue of whether Nicoderm is a medicine, the Federal Court, relying on the Federal Court of Appeal in ICN Pharmaceuticals, Inc. v. Canada (Staff of the Patented Medicine Prices Review Board),  1 F.C. 32 (F.C.A.) (ICN), found that, as the word “medicine” was to be interpreted broadly and in its ordinary meaning, Nicoderm fell within the definition of “medicine”. The Federal Court, again relying on ICN, found that both Patents ‘700 and '340 (granted under the Patent Act, Pre October 1, 1989, version) did pertain to the medicine when applying the “merest slender thread” interpretation as articulated by the Federal Court of Appeal, and that a patent may pertain to the medicine even though it is not being used. The Federal Court, however, dealing with the issue of patent applications (filed under a subsequent version of the Patent Act, Post October 1, 1996, version) found that, as a patent application gives rise only to a potential grant of patent, the PMRPB was not authorized to assert jurisdiction until the patent issued. No appeal having been filed in the Federal Court of Appeal, this matter was remitted to the Board. The Federal Court decision is available on our Web site under Regulatory; Hearings; Nicoderm. Dovobet is a medicine indicated for the topical treatment of active lesions of psoriasis vulgaris in adult patients. On November 29, 2004, the Chairperson issued a Notice of Hearing in the matter of LEO Pharma Inc. (LEO Pharma) and the price of its medicine Dovobet. The Board released its decision on the merits of this case on April 19, 2006. The Board found that LEO Pharma had sold Dovobet at an excessive price but did not rule that LEO Pharma had engaged in a policy of excessive pricing. LEO Pharma has appealed the Board's decision to the Federal Court of Canada. The Board's decision is available on our Web site under Regulatory; Hearings; Dovobet. Adderall XR is a medicine indicated for the treatment of Attention Deficit Hyperactivity Disorder (ADHD). On January 19, 2006, the Vice-Chairperson issued a Notice of Hearing in the matter of Shire BioChem Inc. (Shire) and the price of its medicine Adderall XR. The purpose of the hearing is to determine whether, under sections 83 and 85 of the Patent Act, Shire is selling or has sold the medicine Adderall XR in any market in Canada at a price that, in the Board's opinion, is or was excessive; and, if so, what order, if any, should be made. Shire began selling Adderall XR 10 mg, 20 mg, and 30 mg capsules in Canada under the Special Access Program on September 12, 2002. On April 13, 2004, Shire began selling three additional strengths of Adderall XR, 5 mg, 15 mg, and 25 mg.
Health Canada issued a Notice of Compliance for the six strengths of Adderall XR on January 23, 2004. The hearing on the merits of this case commenced on April 24, 2006. Risperdal Consta is a new formulation of an existing compound (risperidone) indicated for the management of the manifestations of schizophrenia and related psychotic disorders. On January 31, 2006, the Vice-Chairperson issued a Notice of Hearing in the matter of Janssen-Ortho Inc. (Janssen-Ortho) and the price of the medicine Risperdal Consta. The purpose of the hearing is to determine whether, under sections 83 and 85 of the Patent Act, Janssen-Ortho is selling or has sold the medicine Risperdal Consta in any market in Canada at a price that, in the Board's opinion, is or was excessive; and, if so, what order, if any, should be made. Health Canada issued a Notice of Compliance for Risperdal Consta 25 mg, 37.5 mg, and 50 mg vials on July 16, 2004. Janssen-Ortho began selling Risperdal Consta in Canada on September 21, 2004. The Board is scheduled to commence its hearing on the merits of this case on June 7, 2006. On February 21, 2006, the Vice-Chairperson issued a Notice of Hearing in the matter of 3M Canada Company (3M Canada), and the price of the medicine Airomir. The purpose of the hearing is to determine whether, under sections 83 and 85 of the Patent Act, 3M Canada is selling or has sold Airomir in any market in Canada at a price that, in the Board's opinion, is or was excessive; and if so, what order, if any, should be made. The hearing on the merits of this case is scheduled to commence on July 12, 2006. Copaxone is indicated for use in ambulatory patients with relapsing-remitting multiple sclerosis to reduce the frequency of relapses. On May 8, 2006, the Vice-Chairperson issued a Notice of Hearing in the matter of Teva Neuroscience G.P. – S.E.N.C. (Teva), and the price of the medicine Copaxone. The purpose of the hearing is to determine whether, under sections 83 and 85 of the Patent Act, Teva is selling or has sold Copaxone in any market in Canada at a price that, in the Board's opinion, is or was excessive; and if so, what order, if any, should be made. The hearing on the merits of this case is to commence in the fall. The PMPRB estimates total manufacturers' sales by summing sales of patented, non-patented brand name and generic drugs. For this purpose, a “patented drug” is any product currently subject to the PMPRB price review. A “nonpatented brand name drug” is a product sold by a current patentee (that is, a manufacturer currently selling one or more products subject to the PMPRB price review) that is not itself currently patented (either because a patent is pending, all patents applicable to the product have expired or because the product was never patented). Patentees are required, under the Patented Medicines Regulations, 1994, to report their total sales of drugs in Canada, both patented and non-patented, to the PMPRB.5 Patentees are also required to submit detailed information on their sales of currently patented drugs, with sales broken down by product, class of customer and province/territory. This information allows the PMPRB to directly calculate sales of patented drugs for each patentee, and to infer the amount of each patentee's total drug sales attributable to non-patented drugs. To complete its calculations, the PMPRB obtains an estimate of sales by members of the Canadian Generic Pharmaceutical Association (CGPA).6 This estimate constitutes the generic component of sales the PMPRB uses in calculating total manufacturers' sales. Sales Trends. 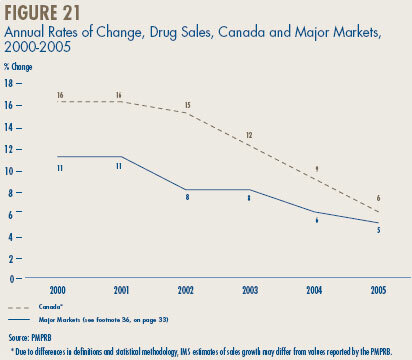 Table 8, on page 20, gives the estimated amount of total manufacturers' sales of drugs in Canada for the years 1990 through 2005.9 Sales rose to $16.1 billion in 2005, an increase of 1.3% over 2004 sales. This rate is markedly less than the rate of 5.3% recorded in the previous year and the rate of 15.2% recorded in 2003. It is the lowest rate of the last fifteen years. 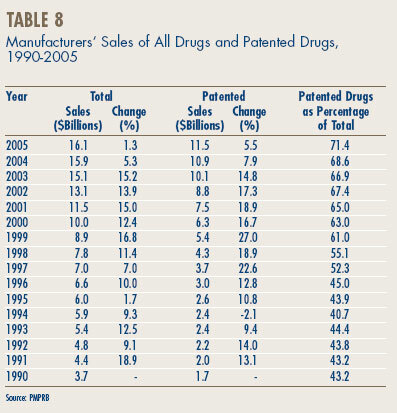 Sales of patented drugs rose to $11.5 billion in 2005, an increase of 5.5% over the corresponding 2004 value. This is the lowest rate of increase since 1994. The share of patented drugs in total sales rose to 71.4% in 2005, extending a pattern that began in 1994 (when patented drugs accounted for just 40.7% of total sales). 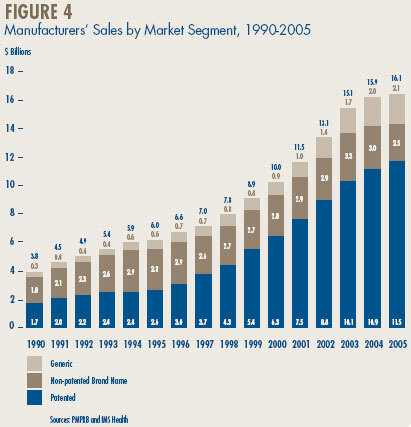 Figure 4 provides more detail on the composition of manufacturers' sales. The decline in the relative importance of non-patented brand name drugs is particularly remarkable. 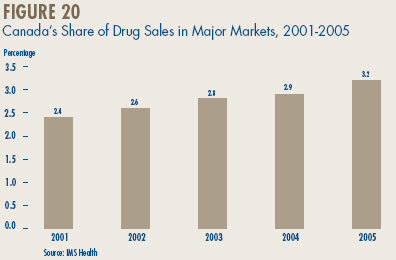 In 1995, the market segment accounted for nearly half of the total drug sales. With practically no sales growth since the early 1990s, the nonpatented brand name share of total sales has declined steadily, reaching 15.5% in 2005. In contrast, the share of generic products has risen over the same period, standing at 10.0% in 1995 and at 12.9% in 2005. The recent pronounced decline in sales growth among patented drugs is a striking development, considered in light of the double-digit growth rates recorded from 1995 to 2003. A possible explanation of this development begins by recognizing that throughout the 1990s growth was largely driven by a succession of new “blockbuster” products that ultimately achieved very high sales volumes. (The class of products known as “statins” – anti-cholesterol drugs – offers an excellent example.) Since the beginning of the current decade, the pharmaceutical industry has not introduced new high-volume products in sufficient numbers to sustain the double-digit sales growth seen in the 1990s. Table 9, on page 21, breaks down manufacturers' sales for the years 2001 through 2005 by the year in which products were introduced to the Canadian market. In particular, the table gives the amount of sales attributable to products that were available in Canada before 1991, those that came into the Canadian market between 1991 and 1994, between 1995 and 1999, between 2000 and 2004, as well as those new products that came into the Canadian market in 2005. 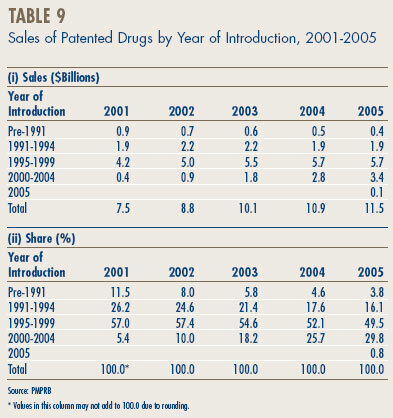 The results in Table 9 demonstrate that patented products introduced between 2000 and 2004 have generated a substantially smaller volume of sales than products introduced between 1995 and 1999; in 2005 the more recently introduced products accounted for $3.4 billion, compared to $5.7 billion for products introduced in the 1995-1999 period. As a result, the latter set of products still accounted for nearly half of sales in 2005. The results in Table 9 also help to explain why sales growth has dropped off so suddenly. The relatively small sales impact of new products was partially hidden in the first few years of this decade by the still growing sales of products introduced in the 1995-1999 period. Sales of such products grew by 18.6% in 2002 and 9.5% in 2003, and still accounted for well over a third of overall sales growth in the latter year. This contribution was much reduced in 2004 and disappeared altogether in 2005. At the same time, sales of products introduced in the 2000-2004 period began to stabilize: these products generated new sales of only $6.1 billion in 2005. Clinical developments related to a particular class of drugs (discussed in more detail below) also affected 2005 sales. These developments likely reduced sales of patented drugs by 2% - 3%. Note that without this factor the 2005 rate of sales growth would have been approximately the same as that recorded in 2004 (7.9%) – that is, still much below the rates recorded from 1995 to 2003. 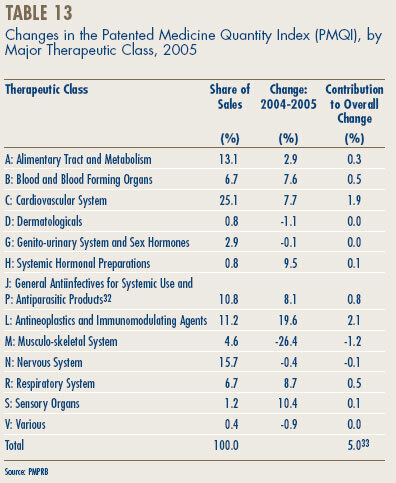 Sales by Therapeutic Class. 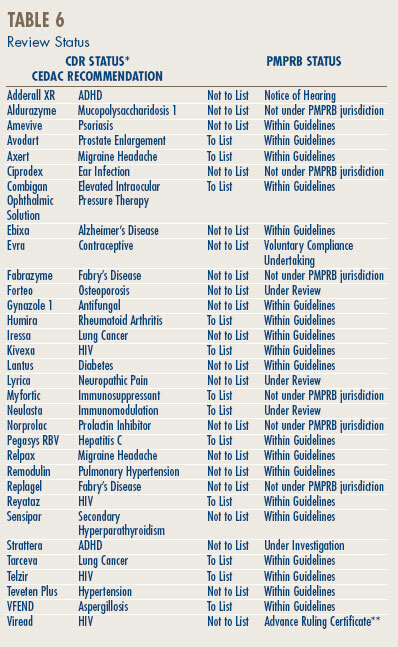 For purposes of price review, the PMPRB classifies drugs using the World Health Organization's (WHO) Anatomical Therapeutic Chemical (ATC) classification system. This is a hierarchical system that classifies drugs according to their principal therapeutic use and chemical composition. At its most aggregate level, “ATC Level 1”, the ATC system classifies drugs according to the aspect of human anatomy with which they are primarily associated. drugs related to alimentary tract and metabolism. These three classes accounted for more than four-fifths of the growth in manufacturers' sales between 2004 and 2005. As in 2004, this year the leading contributor to sales growth is antineoplastics and immunomodulating agents. Cardiovascular and alimentary tract drugs have been a leading driver of sales growth for many years. It is worth noting that several therapeutic classes that have emerged as important sales drivers in past years, such as drugs related to the nervous system, contributed relatively little to sales growth in 2005. The large decline in sales of the drugs related to the musculo-skeletal system should be noted. More detailed analysis shows that this decline was concentrated among a few products in the ATC Level II class “Anti-Inflammatory and Anti-Rheumatic Products” (M01). This class includes Vioxx, which was taken off the Canadian market in 2004 as a result of new clinical evidence. 5 Statistical results presented in this Annual Report are based on sales data submitted to the PMPRB by patentees as of March 2005. On occasion manufacturers report substantial revisions to previously submitted data, which the PMPRB incorporates into all subsequent calculations. For this reason, results reported here may be revised in a future Annual Report. 6 These estimates are obtained from IMS Health, Canadian Hospital and Pharmacy Audit. 7 Previous Annual Reports have found little change in patented drug prices with sales among patented drugs growing by double digits. 8 Studies conducted by the PMPRB of public pharmaceutical insurance plans indicate that increased utilization of existing and new drugs accounts for most of the recent growth in expenditures. PMPRB, Provincial Drug Plan Overview Report: Pharmaceutical Trends, 1995/96 -1999/00, September 2001. 9 Beginning with the year 1999, the calculation of manufacturers' sales of all drugs and patented drugs includes the sales of drug products for human use only. 10 It should be noted that shares of sales by ATC class for all drugs in Canada may differ from shares for patented drugs only. 11 These groups have been combined for reasons of confidentiality. It is important to understand the conceptual relationship between the PMPI and drug costs. The PMPI does not measure the effects of changes in the utilization on drug spending: a quantity index, the PMQI, is calculated for this purpose. Nor does it reflect the cost-impact of changing prescribing patterns. By design, the PMPI isolates the component of changing drug costs attributable to underlying changes in patented drug prices. That the PMPI has not kept pace with the CPI is not surprising. The PMPRB's Guidelines require that the increase in the price of each patented drug be no more than CPI-inflation over any three-year period. (The Guidelines also impose a cap on year-over-year price increases equal to one-and-one-half times the rate of CPI-inflation.) These requirements have the effect of establishing CPI-inflation as an upper bound on the rate at which the PMPI may rise over any period of three years.17 Increases in the PMPI normally do not reach this upper bound because some manufacturers either do not raise their prices by the full amount permitted under the Guidelines, or reduce their prices. Figure 7, on page 25, provides information on the extent to which manufacturers have taken the increases permitted under the PMPRB Guidelines. In 2005, 61% of patented drug prices rose between zero and the allowable maximum, compared to only 38% in 2001. Among the 200 highest-selling drugs, 77% took price increases within the allowable maximum in 2005, up from 41% in 2001. These proportions have risen in each of the last four years. With a single exception, all the class-specific rates of price change in Table 11 fall within a fairly narrow band of about ±1%. The outlier is the class “Various” (ATC Class V) which, with a price increase of 82.8%, had the single largest influence on the PMPI. Price Change by Class of Customer. 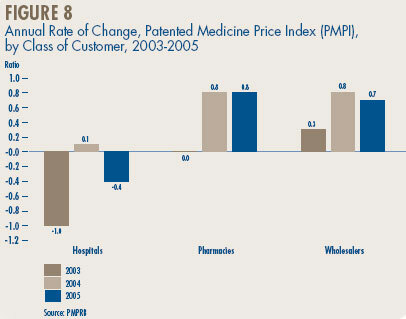 Figure 8 reports average rates of price change by class of customer.21 These results were obtained by applying the PMPI methodology to data on sales of patented drugs divided into sales to hospitals, to pharmacies and to wholesalers.22 In 2005, rates of price change ranged from 0.8% for direct sales to pharmacies to -0.4% for sales to hospitals. Not surprisingly, the rate of price change for sales to wholesalers (which account for about three-quarters of all sales) is very close to the overall change in the PMPI. Note that no customer class experienced a rate of price change exceeding CPI-inflation. Price Change by Province/Territory. Figure 9 provides average rates of price change by province/territory. These results were obtained by applying the PMPI methodology to data divided according to the province/territory in which the sale took place. Rates of price change obtained for 2005 range from 1.7% in Alberta to -0.4% in Prince Edward Island and -0.3% in Quebec. Note that no jurisdiction experienced a rate of price change exceeding the PMPRB Guidelines. 12 Annualized PMPI results are obtained by averaging results for the first and last six months of each year. 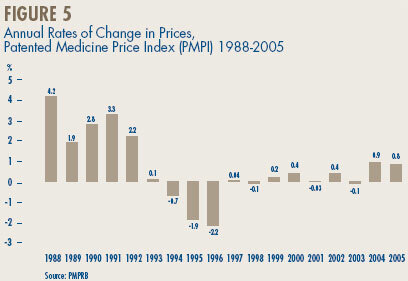 13 See the PMPRB's A description of the Laspeyres methodology used to construct the Patented Medicine Price Index (PMPI), March 1997, revised June 2000, for a detailed explanation of the PMPI. Restricting the PMPI to products for human use began in 1999. 14 As a result of additions and corrections submitted by patentees, the rate of PMPI change for 2004 has been revised to +0.9 %, from the value of -0.2% reported in the 2004 Annual Report. For the same reason, rates of -1.2% and -1.1% previously reported for 2002 and 2003, respectively, have been revised to 0.4 and -0.1. Recent data adjustments have had little effect on the PMPI results for earlier years. Figure 5, reflects all revisions. 15 1992 is the only year in which the PMPI rose at a faster rate than the CPI. To facilitate and encourage compliance by patentees, the PMPRB's CPI-adjustment methodology uses the forecast rate of CPI-inflation published by the Department of Finance. The forecast CPI-inflation rate for 1992 had been 3.2%, but the actual rate was 1.5%. For a full explanation of the CPI-adjustment methodology, please refer to Schedule 4 of the PMPRB's Compendium of Guidelines, Policies and Procedures. 16 Statistics Canada, CANSIM, Series V735319. For 2005 as a whole, consumers paid an average of 2.2% more than they did in 2004 for the goods and services included in the CPI basket. 17 In principle this allows the year-over-year rise in the PMPI to exceed CPI-inflation, although this has not occurred since the PMPRB instituted its CPI-based limits on price increases. measured by its share of overall sales. 19 These groups have been combined for reasons of confidentiality. 20 The decomposition in this column is approximate because the weights are derived from annual sales data, whereas the PMPI is calculated from data covering periods of six months. 21 The Patented Medicines Regulations, 1994, require patentees to file information according to 4 classes of customers (hospitals, pharmacies, wholesalers and others). 22 Results for a fourth customer class, “Others”, are not provided. Buyers in the “Others” class are principally healthcare institutions other than hospitals, such as clinics and nursing homes. This class accounted for about 5.3% of patented drug sales in 2005.
to compare drug prices in Canada to those in other countries. Multilateral Price Comparisons. 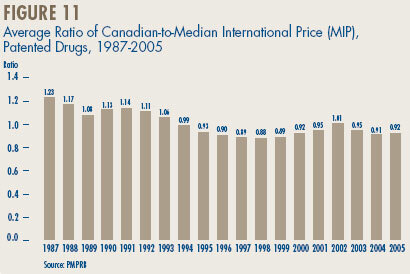 Figure 11 shows the average ratio of Canadian prices to the median of prices among the seven comparator countries (known as the median international price or MIP) over the years 1987 through 2005.23 Canadian prices were on average 23% higher than the MIP in 1987. The average ratio declined to 0.88 in 1998. After rising to 1.01 in 2002,24 the average ratio has remained below parity. In 2005, the average Canadian-to-MIP ratio was 0.92. 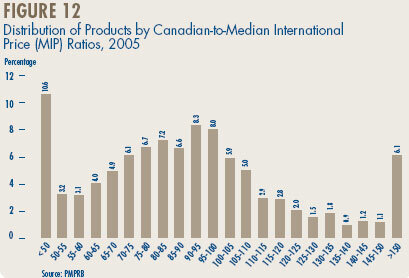 Figures 12 and 13 offer more detail on the product-level Canadian-to-MIP ratios underlying the average 2005 ratio reported in Figure 11 on page 27. Figure 12 provides the distribution of products by their 2005 Canadian-to-MIP price ratio: each bar in this figure represents the proportion of products whose 2005 Canadian-to-MIP price ratio fell within the corresponding range. Figure 13 provides a similar distribution of manufacturers' sales. In 2005, product level price ratios were heavily concentrated around parity: 55.4% of Canadian product prices (representing 67.6% of sales) were within ± 25% of the MIP. 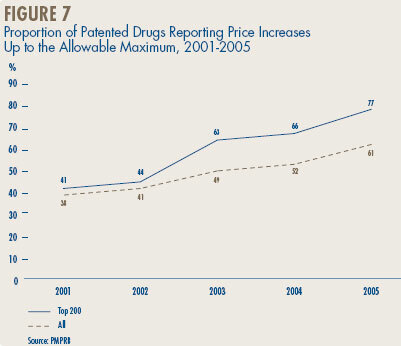 For 68.6% of the drug products (63.2% of sales), Canadian prices were less than the corresponding MIP. Instances where the Canadian price was less than 75% of the MIP were common, accounting for 31.9% of products (19.0% of sales). On the other hand, cases where the Canadian price was more than 125% of the MIP were comparatively rare, accounting for only 12.7% of products (13.4% of sales). Taken together, these results suggest an average ratio close to but still somewhat less than parity, precisely the result depicted in Figure 11, on page 27. Bilateral Comparisons. 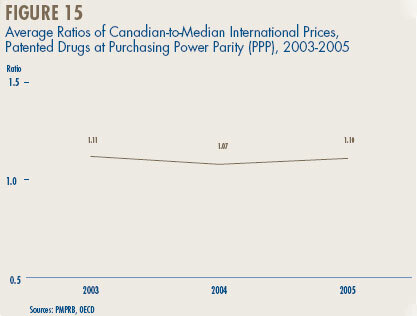 Figure 14, on page 29, gives the average ratio between prices in each of the seven comparator countries, taken individually, and corresponding Canadian prices. (Note that these results were obtained by converting foreign prices to their Canadian dollar equivalents at market exchange rates. Results based on conversion at purchasing power parities are presented below.) In 1987, Canadian prices were, on average, below U.S. prices but above those in all other countries. By the mid-1990s the situation had changed dramatically, with Canadian prices in the mid-range of the six European countries. This pattern continued in 2005, with Canadian prices of patented drugs being on average somewhat less than those in the U.K., Germany and Switzerland, but greater than prices in Italy, France and Sweden. As in previous years, U.S. prices25 were substantially higher than prices in Canada. Average Price Ratios: Analysis of Changes. Rows (i) and (ii) in Table 12 on page 30, give average foreign-to-Canadian price ratios obtained with data for the years 2004 and 2005, respectively. There was little movement in the ratios, except for the U.K.-to- Canada, and U.S.-to-Canada ratios, which both declined appreciably. Results in row (i) and those in row (ii) do not encompass the same set of products. Every year new patented drugs enter the Canadian market, while patents on older products expire (and, in a few cases, patented products are withdrawn from sale). Turnover within the set of patented products sold in Canada is thus a possible source of year-to-year changes in the average ratios. To control for this factor, row (iii) provides results based on 2005 sales data restricted to the set of drugs patented and sold in Canada in both 2004 and 2005. These results are very close to the unrestricted results for 2005, indicating that product turnover in fact had little impact on the ratios. It follows that the observed declines in the U.K.-to-Canada, and U.S.-to-Canada ratios must reflect changes in underlying data. This table suggests that falling U.K. prices were the principal source of the decline in the U.K.-to-Canada ratio. 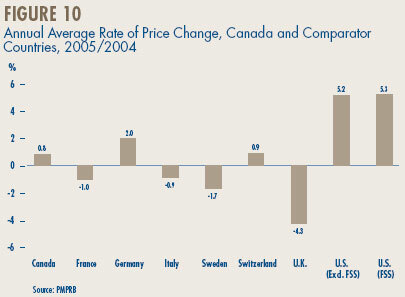 Row (vi) shows that had U.K. prices remained at their 2004 levels, the U.K.-to-Canada ratio for 2005 would have been about six points higher than the value reported in Figure 14. Rows (iv), (v) and (vii) show the partial impacts of exchange rates, Canadian prices, and sales weights were far smaller: taken together, these factors account for a further decline in the U.K.-to-Canada ratio of only a point or so. The decline in the U.S.-to-Canada ratio presents a more complicated case. According to the results in row (iv), the recent appreciation of the Canadian dollar against its U.S. counterpart should have produced a decline of some fourteen points in the U.S.-to-Canada price ratio. The results presented in row (vi) show this currency conversion effect was largely offset by rising U.S. prices, which caused the ratio to rise by roughly eleven points. The net impact of these two factors accounts for about half the decline in the U.S.-to-Canada ratio. Changes in product weighting account for most of the remainder. Price Comparisons at Purchasing Power Parities. The rate of purchasing power parity (PPP) between any two countries represents the relative cost of living in the two countries expressed in their own currencies. In practice, cost of living is determined by pricing out a standard set (or basket) of goods and services at the prices prevailing in each country.28 Because PPPs are designed to represent relative cost of living, they offer a simple and reliable way to account for differences in national price levels when comparing individual prices, incomes and other monetary values across countries. To supply a meaningful answer to this question one must first convert Canadian and foreign drug prices into their consumption equivalents, based on estimates of the cost of living in each country. Use of PPPs is appropriate here, since it is precisely this type of conversion they are designed to perform. Considerations related to cost of living are of no relevance here. To answer this question the analyst must, in effect, reproduce the purely monetary calculation Canadian consumers might perform if they could buy drugs abroad, converting foreign prices to their Canadian dollar equivalents at current market exchange rates. Figure 15, on page 31, reports average Canadian-to-median foreign price ratios. 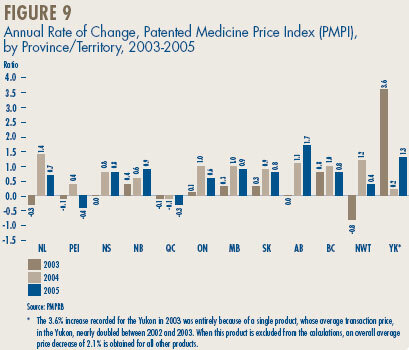 Recall that results obtained using market exchange rates (see Figure 11, on page 27) indicate that in 2005 Canadian patented drug prices were on average 8% less than the corresponding MIP. Results obtained with PPPs indicate that, after adjusting for international differences in cost of living, Canadian prices were on average 10% higher than median foreign prices in 2005. 23 The methodology used by the PMPRB in conducting foreign price comparisons can be found in the Compendium of Guidelines, Policies and Procedures and in two papers published in 2002 entitled Foreign Price Trends for Patented Medicines and Verification of Foreign Patented Drug Prices. 24 The pronounced increase in the average ratios between 2001 and 2002 was due in roughly equal measures to the appreciation of the Canadian dollar against key foreign currencies and short-term movements in foreign prices. The increase disappears when the 2002 ratio is recalculated holding exchange rates and foreign prices at their 2001 values. Similar experiments involving Canadian prices, expenditure weights and the set of drugs used in calculating the ratio show that these factors had no role in causing the increase. 25 The pharmaceutical industry in the U.S. has argued that the publicly available prices in that country do not reflect actual prices because of confidential discounts and rebates. Effective January 2000, and following public consultation, the PMPRB began including prices listed in the U.S. Federal Supply Schedule (FSS) in calculating the average U.S. price of patented drugs. The FSS prices are negotiated between manufacturers and the U.S. Department of Veterans' Affairs. They are typically less than other publicly available U.S. prices reported to the PMPRB by manufacturers. 26 The PMPRB performs all currency conversions for a given period using a simple average of spot exchange rates recorded in the preceding 36 months. This approach has a smoothing effect, limiting the influence of transitory exchange rate adjustments on Canadian-to-foreign price comparisons. It also has the property of phasing in the effects of long-term exchange rate movements. Because of this, a long-term appreciation or depreciation of the Canadian dollar may continue to produce adjustments in Canadian-to-foreign price ratios up to three years after the exchange rate shift has taken place. 27 Note that all of these calculations are again restricted to the set of drugs common to 2004 and 2005. 28 PPP is sometimes defined as the market exchange rate that equalizes the purchasing power of a currency in the two countries over which the PPP is defined. 29 Recent Canada-to-U.S. PPPs imply that a representative set of goods and services costing one US dollar in the United States costs about 1.20 Canadian dollars in Canada. Until recently, the US dollar traded for substantially more than 1.20 Canadian dollars, a fact still reflected in the 2005 value of 36-month moving average Canada/U.S. exchange rate. This is why the U.S.-Canada price difference narrows when PPPs are used instead of market exchange rates. The price and sales data used to calculate the PMPI also allows the PMPRB to examine trends in the quantities of patented drugs sold in Canada. The PMPRB maintains the Patented Medicine Quantity Index (PMQI) for this purpose.30 Figure 17, on page 32, displays average rates of utilization growth, as measured by the PMQI, from 1988 through 2005. 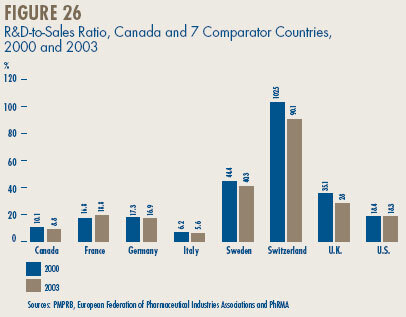 These results confirm that growth in the utilization of patented drugs has been the primary source of rising sales, with rates of utilization growth roughly tracking rates of sales growth in recent years.31 This pattern continued in 2005, with utilization of patented drugs growing by 4.5%, the lowest rate of change since 1994. These two classes accounted for about four-fifths of the overall utilization growth indicated by the PMQI. As might be expected from the previous discussion of sales, utilization of drugs related to the musculo-skeletal system declined substantially, which reduced the PMQI by 1.2%. 30 Like the PMPI, the PMQI is calculated using a chained Laspeyres index formula, with ratios of physical quantities in successive periods replacing the price ratios of the PMPI. Here again, the aggregate value of the index is obtained as a revenue-weighted average of ratios at the level of individual products. Since the PMQI covers only patented drugs it should not be taken to represent utilization trends in the overall pharmaceutical market. 31 Under normal conditions, the annual rates of change in the PMPI and the PMQI will sum to a value approximating the rate of change in patented drug sales. The algebraic relationship is not exact, due to interactions of price and quantity changes. 32 These groups have been combined for reasons of confidentiality. 33 The decomposition in this column is approximate because the weights are derived from annual sales data, whereas the PMQI is calculated from data covering periods of six months. The global drug industry is dominated by a number of large multinational enterprises based in countries other than Canada. 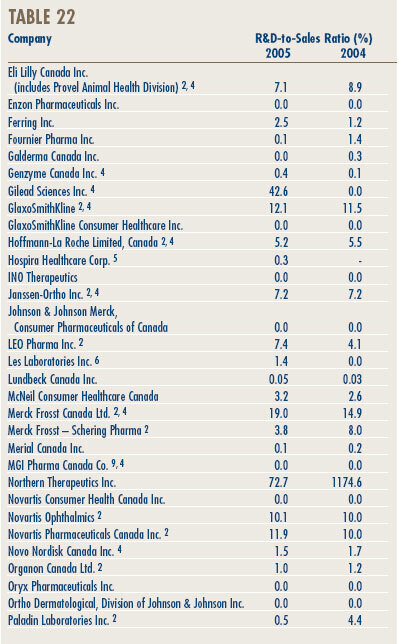 Most of these companies have Canadian subsidiaries which, along with a few Canadian-based manufacturers, account for the manufacture, sale and distribution of drugs in Canada. 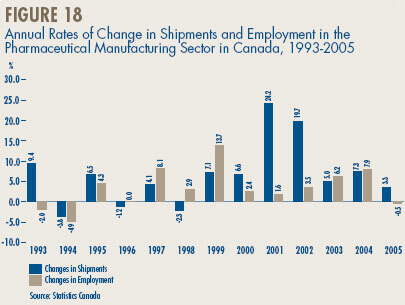 Figure 18 provides year-over-year rates of change in total shipments and employment in drug manufacturing. 34 Employment figures presented in the 2004 Annual Report were taken from the Statistics Canada series V768221, derived from the Annual Survey of Manufacturers. Statistics Canada has terminated this series. In its place the 2005 Annual Report uses the series V1709627, which is derived from the Survey of Employment, Payrolls, and Hours. 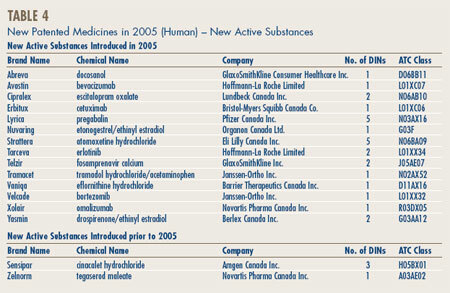 Figures reported in the 2004 Annual Report on sales by Canadian-based pharmaceutical producers were taken from series V768217, representing “sales of manufactured goods”. This series has also been terminated. In its place the 2005 Annual Report uses the series V800188, which represents “shipments, estimated values of goods of own manufacturing”. IMS Health regularly reports on manufacturers' sales to the retail sector across a wide range of countries. IMS reports that in 2005 such sales amounted to $440.0 billion across major markets.36 Figure 19 shows how this amount was distributed among these markets. Drug sales in Canada accounted for 3.2% of total major market sales. The U.S. market is by far the largest in the world, with drug sales exceeding the combined sales of Canada, France, Germany, Italy, Japan and the U.K. 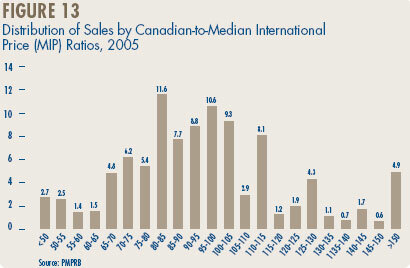 Figure 20 shows Canada's share of major market sales for each of the years 2001 through 2005.37 This share has risen steadily since 2001. As shown in Figure 21, this pattern continued in 2005, with year-over-year sales growth in Canada (6%)38 just slightly ahead of growth in other major markets (5%). Figure 22, which gives sales growth for individual major markets, shows that while Canadian sales growth was less than that observed in Germany, it was greater than that experienced in the U.K., Italy, the U.S. and France. The proportion of national income allocated to the purchase of pharmaceuticals provides another way to compare drug costs across countries.39 Figure 23 gives drug expenditures as a share of Gross Domestic Product (GDP) in Canada and the seven comparator countries, based on data for 2003. 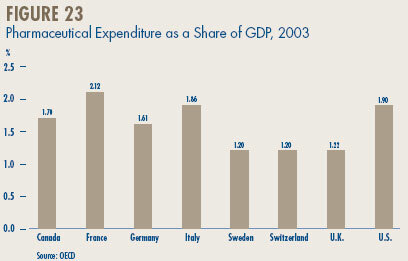 Drug expenditures absorbed between 1.2% and 2.1% of GDP in the seven countries. Canada's expenditure-to-GDP ratio, at 1.7%, was in the middle of this range, greater than ratios prevailing in Sweden, Switzerland, the U.K., and Germany but somewhat less than those observed in Italy, the U.S. and France. The share of national income absorbed by pharmaceutical expenditures has risen in most developed countries over the last decade. 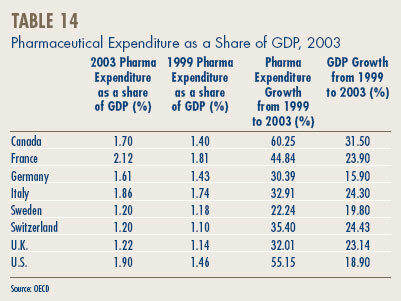 Table 14 shows that between 1999 and 2003 pharmaceutical expenditures grew faster than GDP in Canada and each of the comparator countries. Results for the U.S. are especially striking: here pharmaceutical expenditures grew at nearly three times the rate of growth of national income. Composition of Expenditures. 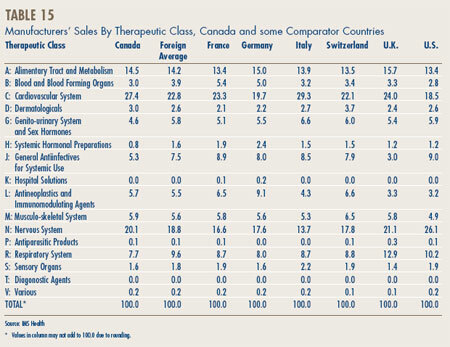 Table 15 shows the composition of manufacturers' sales by therapeutic class across some comparator countries.40 With only a few exceptions, these results imply a remarkable degree of uniformity across countries. In all countries, sales are dominated by cardiovascular and central nervous system products, which account for 37% to 47% in all cases. The next two leading classes – products treating gastrointestinal or respiratory problems – account for a further 22% to 28% of sales. 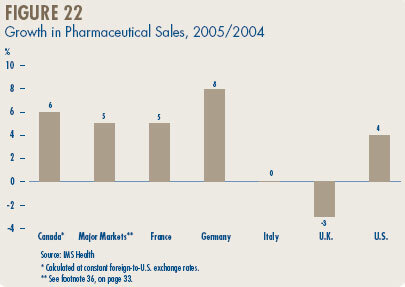 36 IMS Health's Retail Drug Monitor, 2005 (www.imshealth.com). IMS Retail Drug Monitor covers direct and indirect pharmacy (purchases that are direct from the manufacturing company, or indirect through a wholesaler) channel purchases from wholesalers and manufacturers in 13 key countries. Sales figures are at ex-manufacturer prices and include all prescription and certain over-the-counter data. Figures include sales from the hospital sector in Japan and mail order in the U.S. These 13 countries account for over two thirds of the world market. The 13 countries include Argentina, Australia, Brazil, Canada, France, Germany, Italy, Japan, Mexico, New Zealand, Spain, the U.K. and the U.S.
37 The rise in the Canadian share for 2005 reflects in part the recent appreciation of the Canadian dollar against other major currencies. 38 This growth rate is not the same as the PMPRB reported growth rate (Table 8) because IMS Health's Retail Drug Monitor data covers only sales to pharmacies. 39 Comparisons made on this basis will reflect international differences in prices, in overall utilization, in patterns of therapeutic choice, as well as differences in national income. 40 The data used here cover only sales to pharmacies. To address the challenges to Canada's health care system arising from pharmaceuticals, in September 2004, First Ministers committed to the development and implementation of a National Pharmaceuticals Strategy (NPS) as part of an overall 10-year plan to strengthen health care. In establishing the NPS, the First Ministers agreed that “no Canadian should suffer undue financial hardship in accessing needed drug therapies” and that “affordable access to drugs is fundamental to equitable health outcomes for all our citizens”. An important element of the NPS involves achieving international parity on the prices of non-patented drugs. In November 2005, the PMPRB received direction from the federal Minister of Health, on behalf of himself and his provincial/territorial colleagues, to monitor and report on the prices of non-patented prescription drugs. In the context of this function, the PMPRB will publish quarterly reports according to the Terms of Reference agreed to by federal/provincial/territorial governments. The first report is to be published in June 2006. In September 2004, First Ministers met and agreed on a 10-year plan to make health care more responsive and sustainable. Among other things, First Ministers in 2004 agreed that no Canadian should suffer undue financial hardship in accessing needed drug therapies. To this end, they directed Health Ministers to establish a Ministerial Task Force (Task Force) to develop and implement the NPS and report on progress by June 30, 2006. The federal government's commitment to this plan has been reaffirmed in the 2006 budget. The strategy covers a number of initiatives. Of particular relevance to the NPDUIS is work under the NPS to enhance analysis of cost drivers and cost-effectiveness, including best practices in drug plan policies. The NPS work on enhanced analysis of cost-drivers and costeffectiveness is an opportunity for the PMPRB to provide more critical analysis of price, utilization, cost trends and other necessary analysis relevant to decision-makers through the NPDUIS. To better align NPDUIS analysis with the needs of public policy decision makers and address the challenges and opportunities that the NPS presents, the NPDUIS Steering Committee conducted an assessment of information and analysis needs with respect to pharmaceutical management and utilization in 2005. The purpose of the needs assessment was to determine what information stakeholders required to make informed decisions about strategic pharmaceutical management issues. The outcome of the needs assessment provided a basis for priority setting for NPDUIS projects. NPDUIS projects are reported through our NEWSletter and are available on our Web site. Under the Act, the PMPRB monitors and reports on R&D spending, but has no regulatory authority over the amount or type of research spending by patentees. This chapter provides key statistics on the current state of pharmaceutical research investment in Canada. The Act requires each patentee to report its revenue from sales of drugs (including revenue from sales of non-patented drugs and from licensing agreements) and R&D expenditure in Canada related to medicines. The Patented Medicines Regulations, 1994, (Regulations) require that the R&D data submitted to the PMPRB be accompanied by a certificate stating that the submitted information is “true and correct”. The Board does not audit submissions, but it does review submitted data for anomalies and inconsistencies, seeking corrections or clarifications from patentees where these are detected. To confirm that Board Staff has correctly interpreted submitted data, each patentee is given the opportunity to review and confirm the accuracy of its own R&D-to-sales ratio before publication of this report. Under subsection 89(3) of the Act, the PMPRB is to report the identity of patentees who fail to file information before March 1, 2006 as per section 88 of the Act. In 2005, Abbott Laboratories Limited failed to file information on its R&D expenditure by March 1, 2006. A Board Order was not issued in this case as the patentee filed the required information within the further time period provided in Board Staff's letter. The results presented here were derived from data patentees have submitted to the PMPRB. Companies without sales of patented medicines need not report on R&D expenditure and, as new patents are granted and others expire, the set of companies required to file R&D data changes from year to year. For 2005, a total of 80 companies selling human and veterinary drug products filed reports on their R&D expenditure. Of these, 33 were members of Rx&D. For reporting purposes, sales revenue is defined as all revenue from Canadian sales of medicines42 and from licensing agreements. As shown in Table 16, on page 39, patentees reported total sales revenue of $14.2 billion from Canadian sales of drugs in 2005, up 0.5% over 2004. Sales revenue reported by Rx&D members totalled $11.8 billion, accounting for 83% of the total. Less than 1% of reported sales revenue was generated by licensing agreements. As shown in Table 16, on page 39, total 2005 R&D expenditure reported by patentees was $1,234.3 million, up 5.5% over 2004. Rx&D members reported R&D expenditure of $1,040.2 million in 2005 as compared to $1,010.6 million in 2004, an increase of 2.9% over last year, accounting for 84.3% of all reported expenditure. 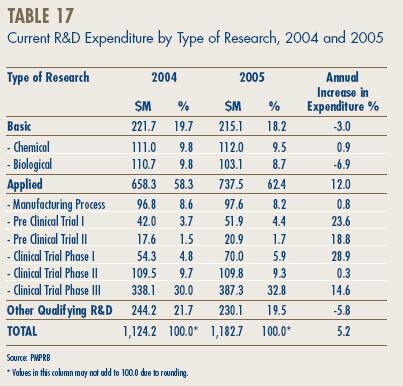 Non-Rx&D members reported R&D expenditure of $194.1 million in 2005, as compared to $161.7 million in 2004, an increase of 20% over last year. The ratio of R&D expenditure to sales revenue for the patented pharmaceutical industry was 8.7% in 2005, up from 8.3% in 2004. The ratio for members of Rx&D was 8.8%, up from 8.5% in the previous year. 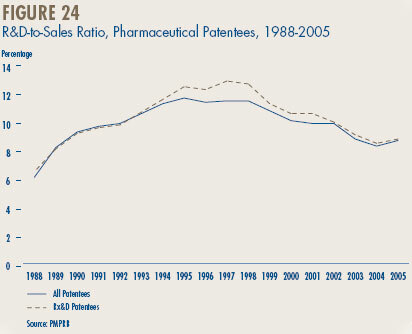 Figure 24 shows that R&D-to-sales ratios for all patentees and for Rx&D members have generally declined in recent years, after rising from 1988 to the mid-1990s. This is the third consecutive year that the ratio is below 10%. 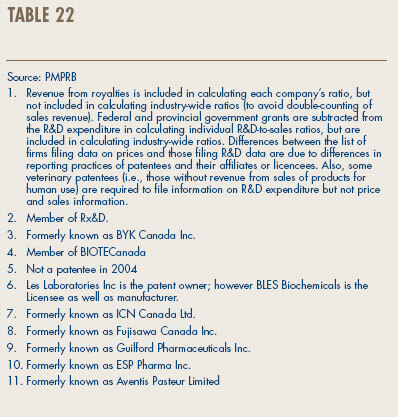 Table 21 in Annex 3, on page 53, provides details on the range of R&D-to-sales ratios. 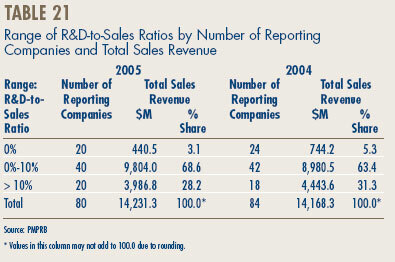 Of the 80 companies reporting in 2005, 60 (or 75%) had R&D-to-sales ratios of 10% or less in 2005. These companies accounted for 72% of total sales revenue. 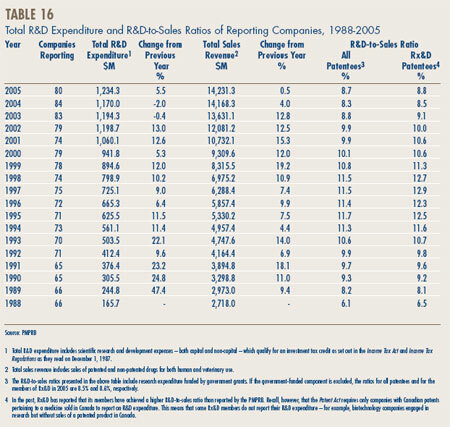 Proportionally more companies had R&D-to-sales ratios above 10% in 2005 compared to 2004 (25% versus 21%) but they represented a smaller share of total sales (28.2 % in 2005, compared to 31.3% in 2004). 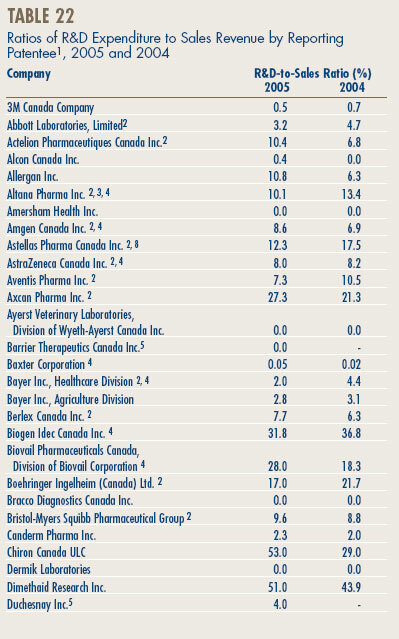 Table 22 in Annex 3, on page 54, lists all reporting patentees and their R&D-to-sales ratios. 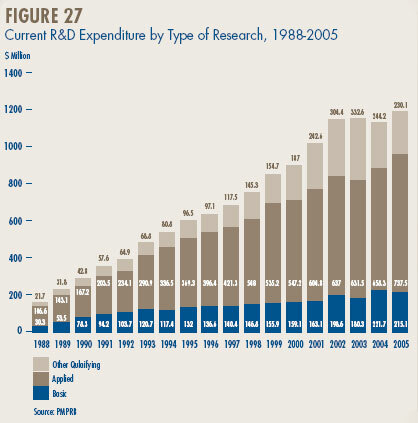 Current R&D expenditure43 was $1,183 million in 2005, accounting for 95.8% of total R&D expenditure. Capital equipment costs and allowable depreciation expenses made up 2.4% and 1.8% of total R&D expenditure, respectively. Table 17 and Figure 25 on page 41, give the allocation of 2005 current expenditure on basic research, applied and other qualifying R&D. Basic research is defined as work that advances scientific knowledge without a specific application in view. Patentees reported spending $215.1 million on basic research, representing 18.2% of current R&D expenditure. Basic research decreased by 3% in 2005 relative to the previous year. Applied research is directed toward a specific practical application, comprising research intended to improve manufacturing processes, pre-clinical trials and clinical trials. Patentees reported spending $737.5 million on applied research, representing 62.4% of current R&D expenditure. Clinical trials accounted for 76.9% of applied research expenditure. Other qualifying research (includes drug regulation submissions, bioavailability studies and Phase IV clinical trials) accounted for the remaining 19.5% of current expenditure in 2005. Patentees report expenditure on research they conduct themselves (intramural) and research performed by other establishments, such as universities, hospitals and other manufacturers (extramural). Table 18 shows that slightly more than one-half (52.6%) of expenditure was intramural, which was down from 55.1% intramural research in 2004. Research performed by other companies on behalf of patentees rose to 22% of current R&D expenditure in 2005, while the combined share of universities and hospitals was 13.9%. 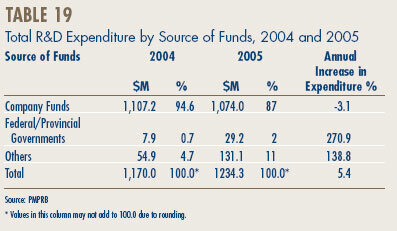 In 2005, as shown in Table 19, patentees funded 87% of R&D expenditure with internal company funds. This is down considerably from 94.6% of company-funded research in 2004. 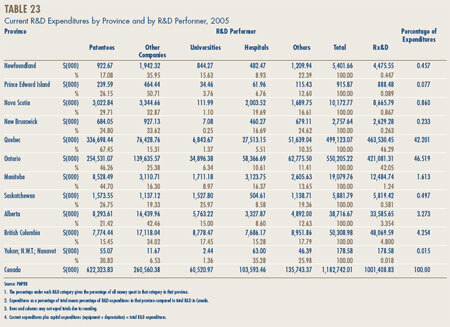 Table 20 below and Table 23 in Annex 3, on page 56, show the current R&D expenditure by province. 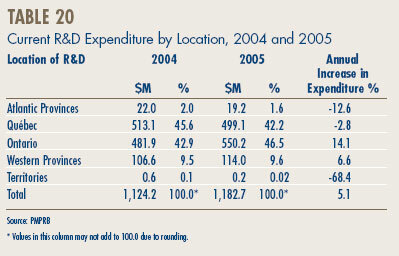 R&D expenditure increased in Ontario and Western provinces in 2005 but decreased elsewhere. As in previous years, expenditure was heavily concentrated in Ontario and Québec, these provinces account for 88.7% of total expenditure. 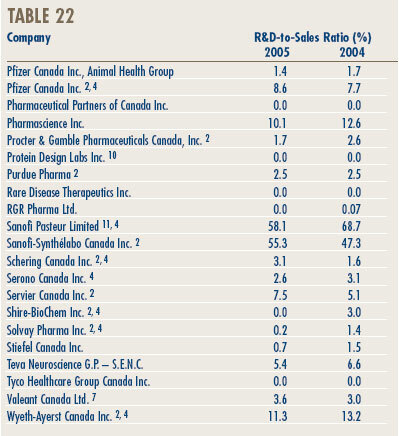 Figure 26 compares Canadian R&D-to-Sales Ratios to those in the seven comparator countries for the years 2000 and 2003.44 As noted above, Canada's ratio stood at 10.1% in 2000. Only Italy (6.2%) had a lower ratio in that year. Switzerland had the highest investment-to-sales ratio at 102.5%, followed by Sweden at 44.4%. France, Germany and the U.S. were in the 16-18% range, while the U.K. was more than double (35.1%). A very similar pattern emerges in the investment-tosales ratios for 2003. Italy (5.6%) remained at the bottom of the range, with Canada second lowest at 8.8%. Ratios in all other comparator countries were again well above Canada's ratio, but showed declines in Switzerland, Sweden and Germany. 42 Sales of drugs for both human and veterinary use are included for the purpose of this section of the Report. 43 Current R&D expenditure consists of non-capital expenses directly related to research, including (a) wages and salaries, (b) direct material, (c) contractors and sub-contractors, (d) other direct costs, such as factory overhead, (e) payments to designated institutions, (f) payments to granting councils and (g) payments to other organizations. These elements are described in more detail in the Patentees' Guide to Reporting – Form 3, available on the PMPRB Web site under the heading Legislation, Regulations and Guidelines. 44 Sales in Figure 26 represent domestic sales and do not include exports. The PMPRB's Research Agenda was established as part of our 1999 Road Map for the Next Decade. Each year since, we have developed the agenda as part of our annual planning process, outlining current and upcoming projects that are or may become subject to public consultations. Over the past year, new projects and initiatives have been added to our regular activities, for example the proposed regulatory amendments, consultations on the Board's Excessive Price Guidelines, NPDUIS projects and, most recently, the non-patented prescription drug price reporting. In order to better serve our stakeholders, we no longer issue the Research Agenda but instead we report, and will continue to report, on projects and initiatives separately in our NEWSletter and on our Web site. The Board remains committed to consulting its stakeholders, as evidenced by its ongoing consultations on the Guidelines, and will continue to do so in order to ensure that their input is reflected in its policies. With the goal of improving the timeliness of its pharmaceutical price review process, the PMPRB has engaged in a revision to the Patented Medicines Regulations, 1994, (Regulations). On December 31, 2005, proposed regulatory amendments were pre-published to the Canada Gazette, Part I for a thirty-day comment period. Numerous submissions were received from interested stakeholders, whose comments were all carefully considered by the Board. These submissions contributed to the evolution of the regulatory amendments, as the PMPRB sought ways to best address stakeholder interests while improving regulatory efficiency. Following Board and ministerial approval of the final, revised version of the proposed amendments, publication in the Canada Gazette, Part II, targeted for early summer, will officially amend the Regulations. Following up on its 2005 consultation on price increases of patented medicines, the Board will now focus on the continued appropriateness and relevance of the Board's current Excessive Price Guidelines (Guidelines). Announced in the April 2006 NEWSletter, this consultation will focus on the relevance of three issues related to the Guidelines: the categorization of innovative drugs; introductory price tests of new drugs; and how the Board addresses the “any market” clause of the Patent Act in the price review process. The first step of the process began on May 23 with the release for public comment of a discussion guide on these issues. Written submissions will be accepted up to late August. The Discussion Guide will be the focal point for a series of targeted meetings to take place across Canada with key stakeholders in November, and those comments received during the summer will facilitate the discussion process. Meetings are planned for Edmonton, Toronto, Montreal, Halifax and Ottawa. Their purpose is to engage stakeholders directly, both to better understand the issues with the current Guidelines and to explore potential options for change. A final meeting is planned for the spring of 2007, at which time the Board will outline its plans with respect to the Guidelines. The PMPRB Communications Program provides a framework for all important aspects of the Board's strategy and practices. As an integral component of management, the Communications Program is an essential tool. It provides advice, develops strategies and aids the decisionmaking process. Ultimately, with this Program, we strive to enhance the awareness of the public and stakeholders in our policies and their interpretation of them. The Communications Program includes the development and maintenance of our communications policies, plans and activities. The Secretariat manages the Program, is responsible for responding to public enquiries and is accountable for the management, direction, development of all communications activities, including media relations, and dissemination of information. To better serve our stakeholders and improve the PMPRB's exposure, we undertook the evaluation of our Web site. We launched a survey and sought feedback from users. As a result, we improved our site and, hopefully, increased its efficiency. We continually seek to inform and gather feedback from our stakeholders through a wide range of communications tools. Transparency, integrity and accessibility remain the central elements of our Communications Program. Adderall XR, Shire BioChem Inc.
Amevive, Biogen Idec Canada Inc.
Avastin, Hoffmann-La Roche Canada Ltd.
Integrilin, Key Pharmaceuticals/Schering Canada Inc.
Solagé, Barrier Therapeutics Canada Inc.
Xolair, Novartis Pharmaceuticals Canada Inc.
Zelnorm, Novartis Pharma Canada Inc.
45 The Research Agenda is no longer published. For a more detailed explanation, see the Research Agenda section, on page 43. This section provides an alphabetical list of acronyms used in the Annual Report 2005. It is also available on our Web site. Category 2 – the first drug to treat effectively a particular illness or which provides a substantial improvement over existing drug products, often referred to as “breakthrough” or substantial improvement.